We had a call from a customer, Megan Karpe, from Simpsonville, South Carolina. 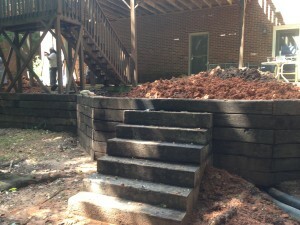 Megan was looking to extend the usable space in her patio by building a retaining wall. The problem that she was experiencing was that she felt crammed on her current patio, and her backyard needed a warmer feel. The backyard goes downhill, which makes it difficult to use. She was able to find out about Cochran Landscaping after we sent out a direct mail piece. She contacted us and we came out and made a plan to install a retaining wall, so the ground could be level near the concrete by the patio. This is a great solution because the drop-off creates more visual appeal. 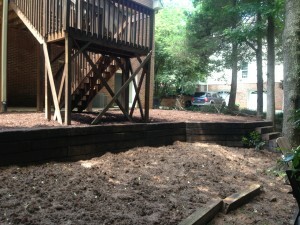 Megan said we did an awesome job and really solved her problem while creating a functional outdoor space. Check out the photos below to see our work! 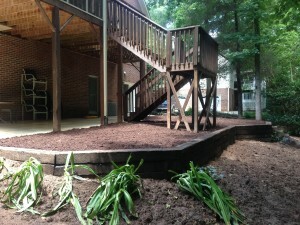 Our experienced team not only does landscaping, but irrigation and repair, and lawn maintenance as well! To learn more about the services that your landscaping leaders provide, click here!